Update: Waku Ghin was awarded 1 Michelin Star in the inaugural Michelin Guide for Singapore in 2016. This was a long overdue first visit to arguably Singapore's most talked-about fine dining restaurant over the past year. Initially, it was the difficulty of getting a reservation, then it was the fear of eating anything sourced from Japan in the aftermath of the tragic earthquake/tsunami. After the passage of time, we deemed it 'safe' to venture back into Japanese haute cuisine and made a reservation way in advance this time. Waku Ghin is the new baby of the Tetsuya Wakuda, who made his name with the most renowned restaurant in Australia, Tetsuya in Sydney. 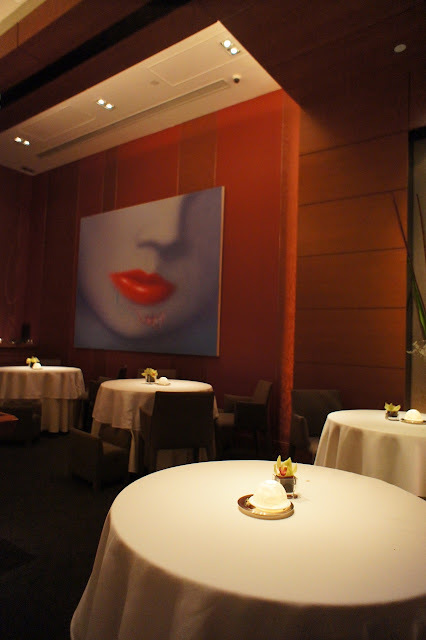 I've never eaten at Tetsuya before, but my friends who have dined there rave about the quality of the food and the dining experience, and how a meal there is like a culinary journey which lasts hours and successfully marries fresh ingredients and innovating cooking in zen-like surroundings. 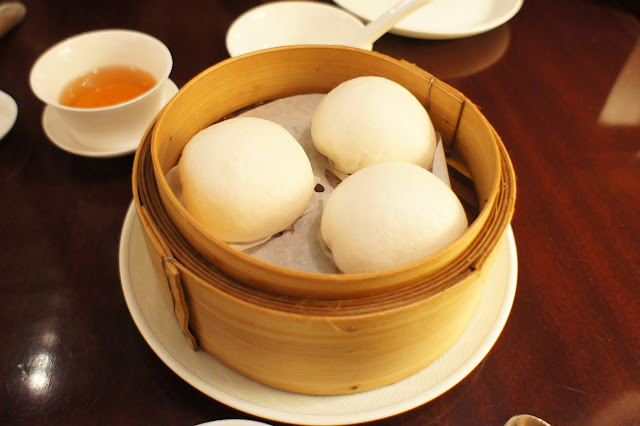 Having dined at some wonderful restaurants in Japan, we were keen to see how one of Japan's most famous exports (he left Japan at a very young age and has been in Australia since) would stack up against the Japanese master chefs. 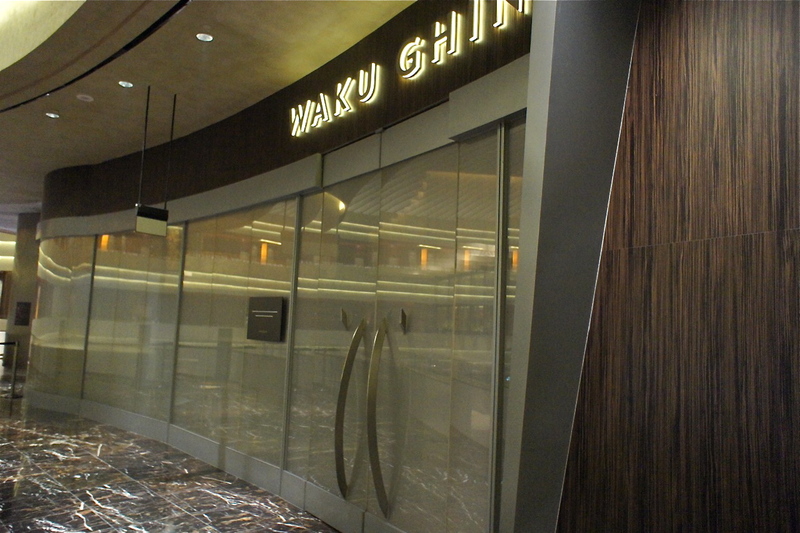 Waku Ghin claims to be a Modern European/Japanese restaurant and is located in the Marina Bay Sands Integrated Resort at the second floor where many of the celebrity chef restaurants are located. It has a rather nondescript entrance and from a distance looks like it's closed. Inside, we were welcomed by an army of service staff (very Japanese), and shown to our seats at a teppanyaki counter in a room which could sit 6 by the counter. 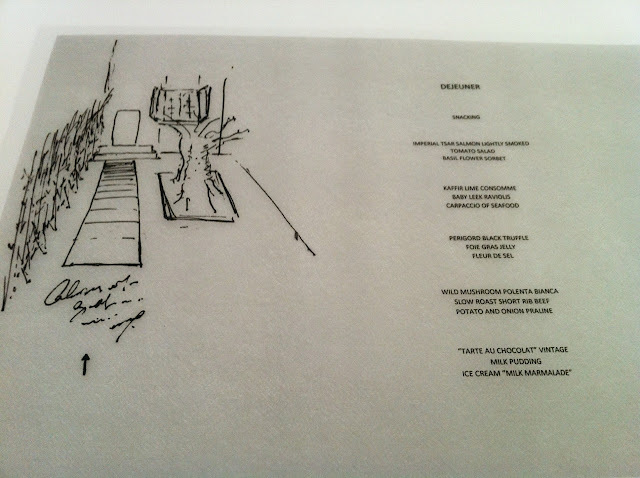 I had a read through of the wine list, which was quite limited in its French selection (but understandably had more of an Australian slant given Waku Ghin's Australian background) and rather pricy. I picked out a 2006 Premier Cru Champ Gain Puligny-Montrachet from Olivier Leflaive which drank very well but was way too expensive (S$300). The interior was quite simple yet had quiet elegance. 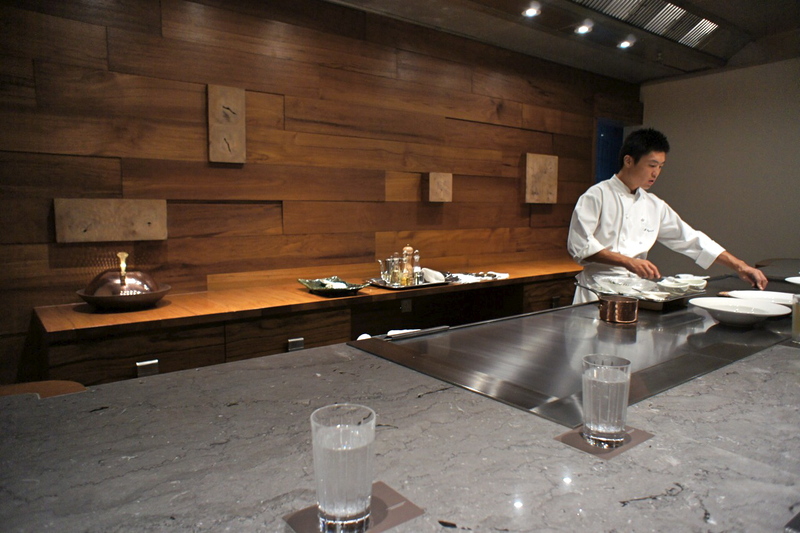 The private room was dominated by a large marble countertop and a teppanyaki grill which could accommodate 2 chefs at any given moment. There was no food menu in Waku Ghin, instead, the waitress asked if we had any allergies or preferences and the food was left to the chef. 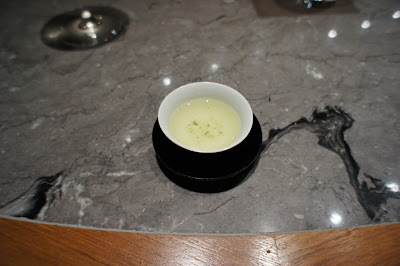 Pacific Oyster from Tasmania with Ginger and Rice Vinegar: this was a nice start to the meal. 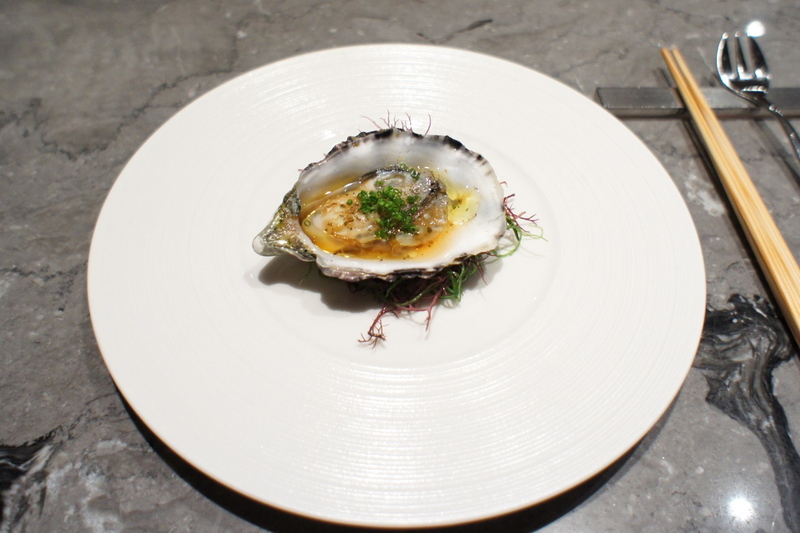 The oyster was fresh and juicy, and the marinate was an improvement over just eating it with lemon juice. 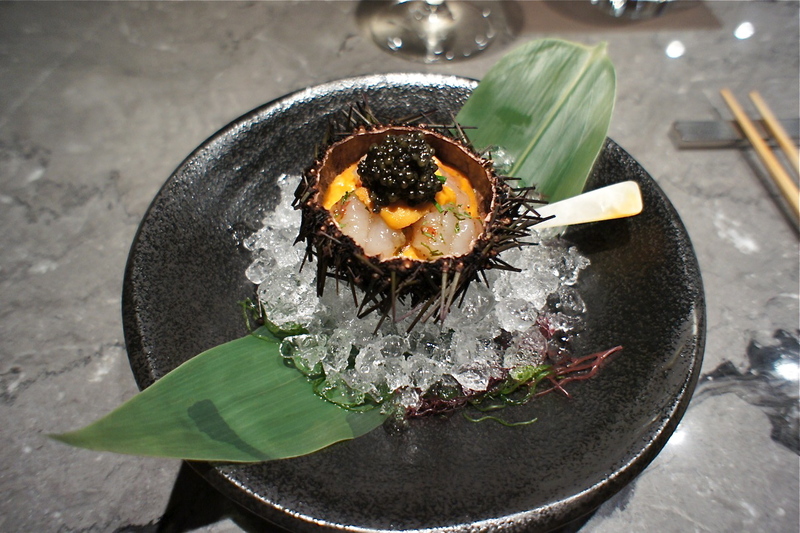 Marinated Botan Ebi with Sea Urchin and Oscietre Caviar: this was supposed to be Waku Ghin's signature dish.Visually it looks really interesting and appealing. And with ingredients like that, it would naturally taste good. However, we failed to see how this was a special dish because there was really nothing unique about this dish. Perhaps for diners who have never eaten uni (sea urchin) out of its shell before, this would be an experience (even so, the uni shell in this case looked roasted or dried, whereas we have eaten uni straight after it has been sliced in 2, such that the spikes are still moving when the insides are being eaten). 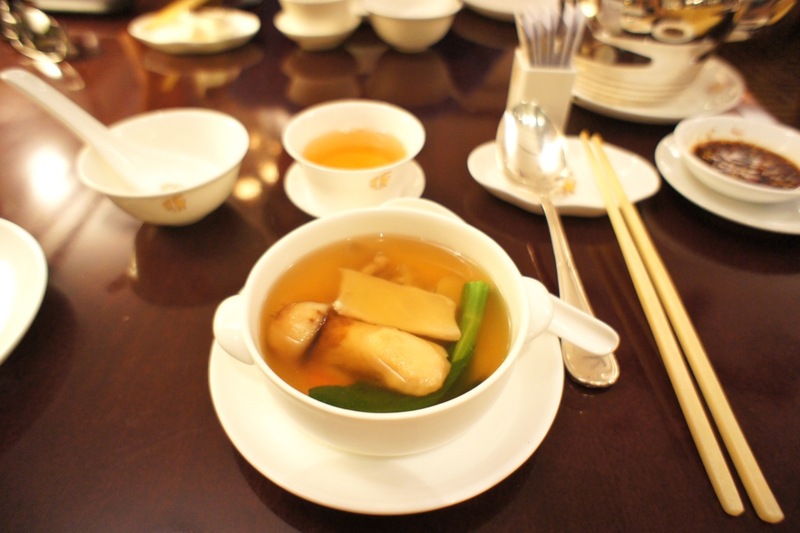 But for those experienced in eating haute Japanese cuisine, this would be quite ordinary. 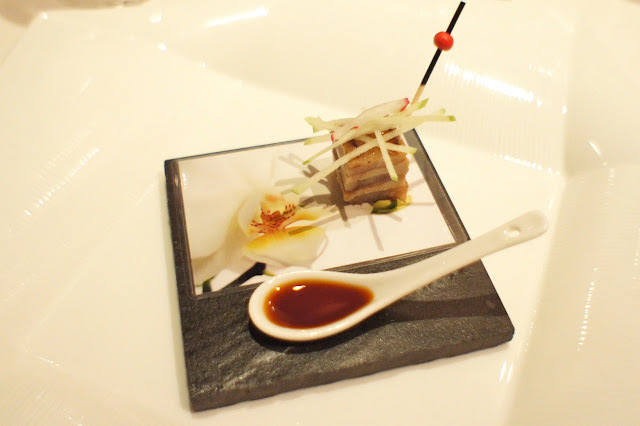 Pan-fried Fillet of Ayu with Daikon and Fennel: this was one of our favourite dishes that night. 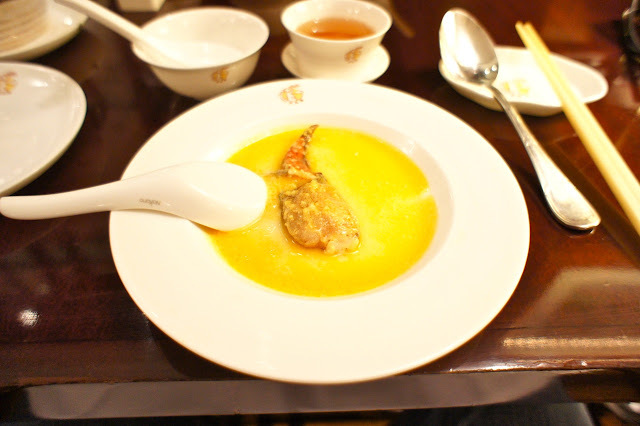 The fish was not overcooked to a crisp but fried just nicely retaining some of the tenderness of the flesh under the skin which was slightly crispy. This combination of the fish with the pulp of the pomelo (I thought there was pomelo in there even though it wasn't mentioned in the description), the daikon and the fennel was very good. Tasmanian Abalone with Fregola and Tomato: the chef cooked the abalone live in front of us and served it with a very Italian-style olive-oil-based sauce with small bits of pasta called fregola (it looked like oversized risotto grains). This was very interesting and also very good. 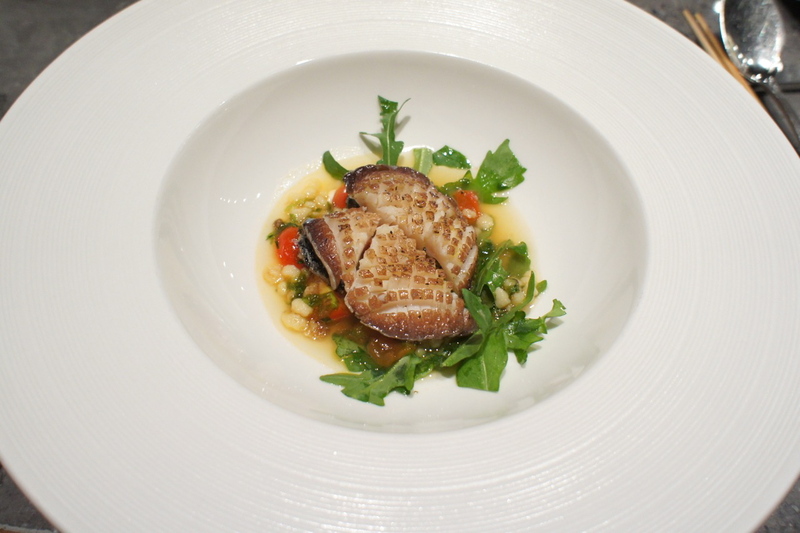 Surprisingly, the rucola leaves in the dish weren't there just as garnish or greens, but its strong flavour had an important role in the taste of the entire dish. It was a light yet delicious course and wouldn't have been out of place if served in an Italian restaurant (except that we have yet to see abalone being served in one). 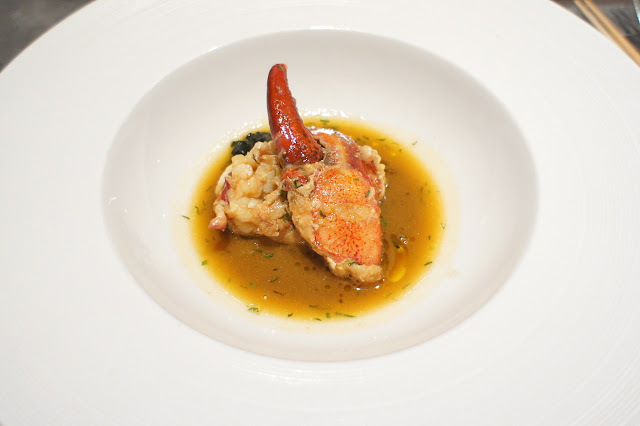 Braised Canadian Lobster with Tarragon: this was a lobster with a relatively small body but very large claws. It was cooked by braising in a copper pan on the teppanyaki grill, with lobster reduction and I suspect some cognac. 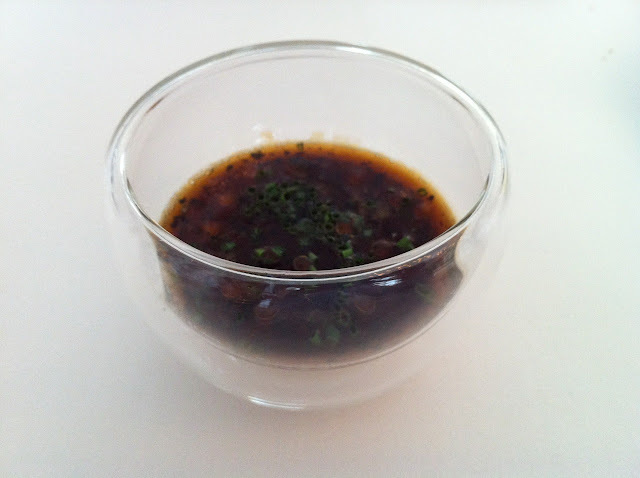 The sauce in particular was very rich and tasty, kind of like a lobster bisque but without using cream. 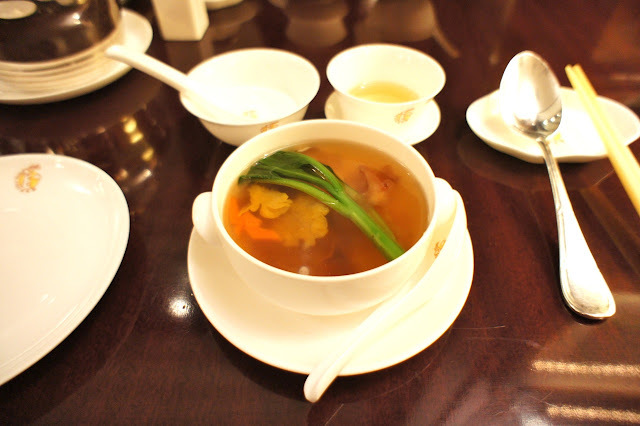 It was a very good dish. Sumiyaki of Tasmanian Grass Fed Beef Steak with Tasmanian Wasabi Mustard: a simple piece of Australian tenderloin but charcoal grilled beforehand (to give its smoky flavour) and cooked on the teppanyaki grill with some mirin to give it flavour. We are not fans of the tenderloin as on its own it has little flavour, but this was cooked very nicely and the mirin made a big impact on giving the beef its taste. 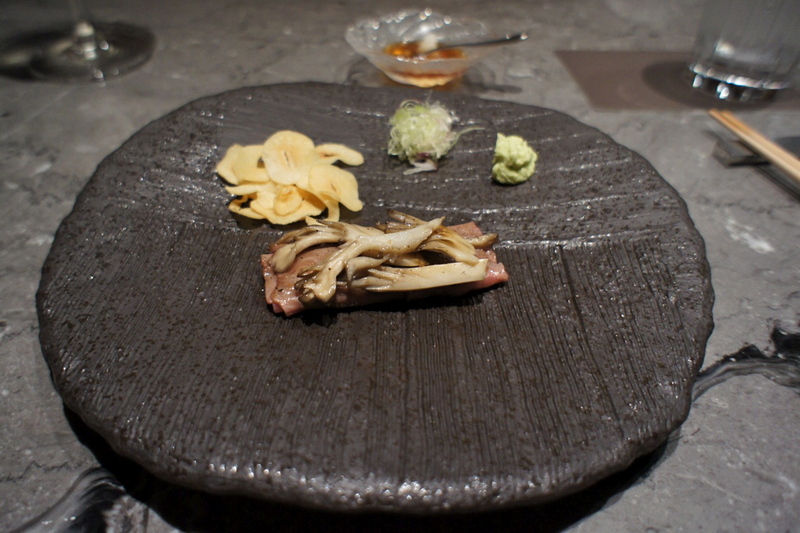 Japanese Ohmi Wagyu Roll from Shiga Prefecture with Maitake Mushroom: The final main course was the fatty and expensive Japanese beef. 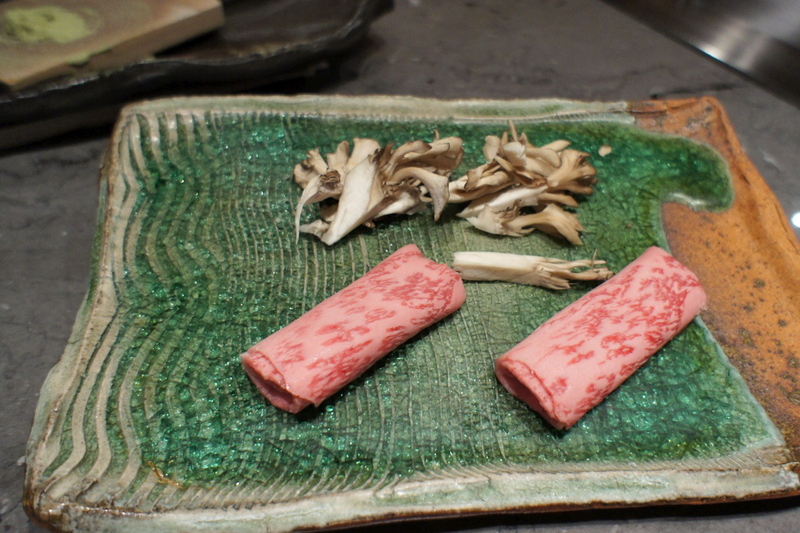 The mushrooms were quite special too and were delicious. 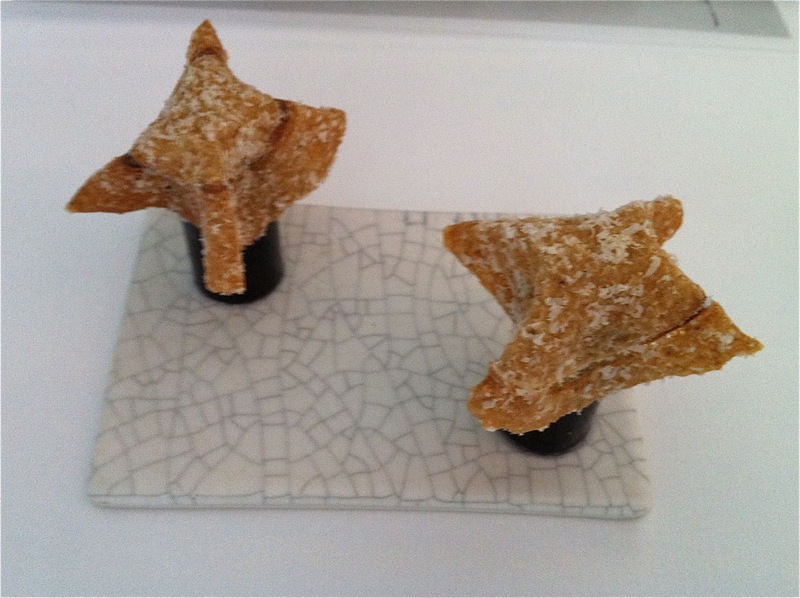 These were accompanied by garlic chips. 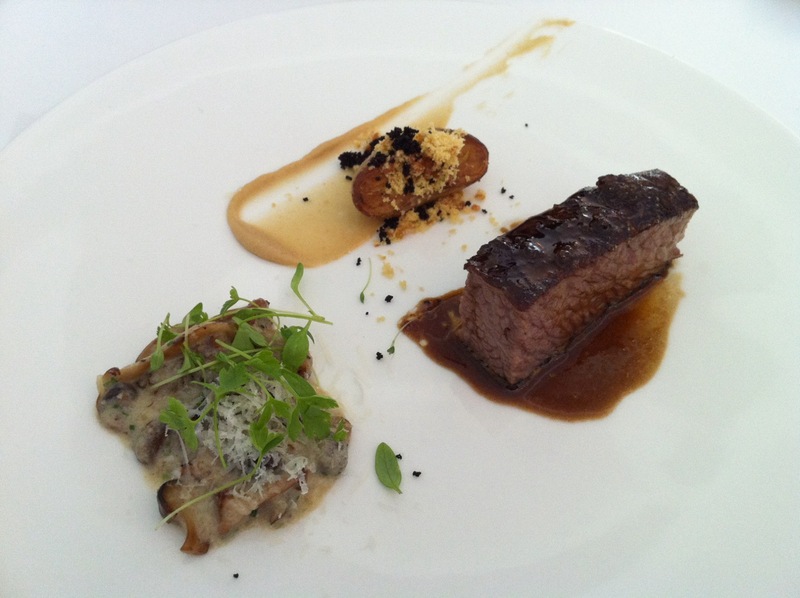 The beef was very tender, yet somehow failed to give off the usual flavours one would come to expect from top grade wagyu. 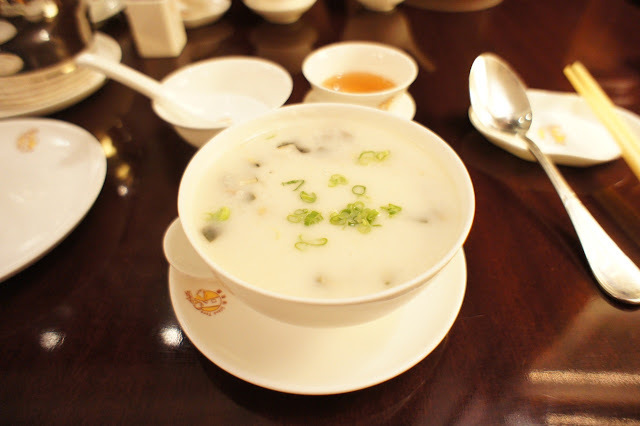 The portion was very small and this wasn't anywhere near the best waygu we have eaten. In many ways, this was supposed to be the culmination of the meal and turned out to be quite the anti-climax. It looked like something we had at Kahala in Osaka a few years back (also thin piece of top grade wagyu on a teppanyaki grill) but that was a hundred times better (see earlier review: Kahala). 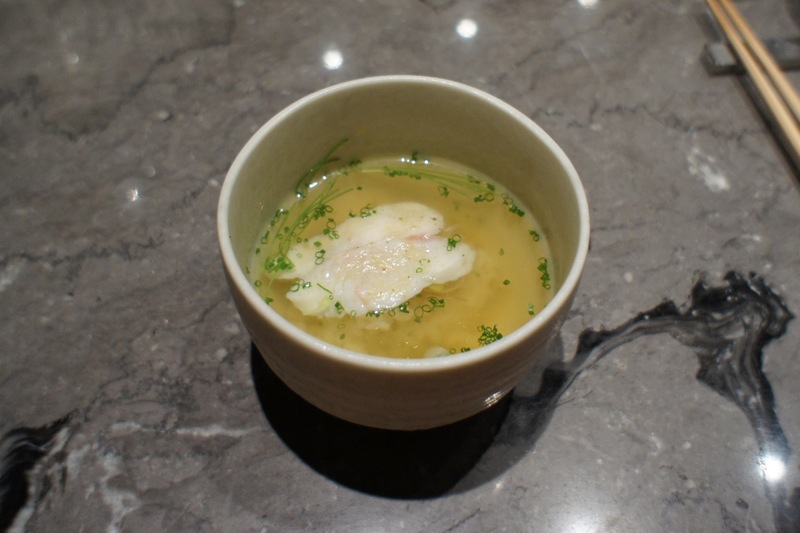 Consomme with Rice and Hirame: As a filler, we were served some japanese rice drowned in chicken soup with 2 pieces of flounder in it. 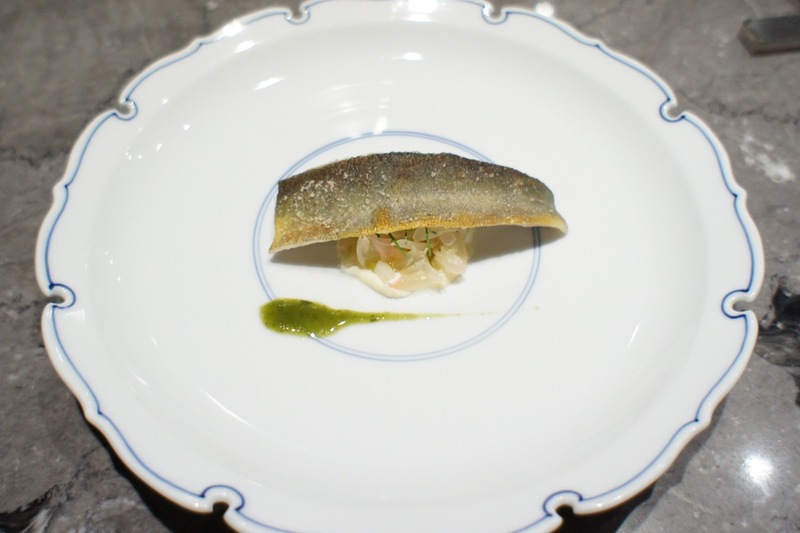 Forgettable dish. It reminded us of a similarly forgettable (ironic then that we remembered) rice dish at Iggy's recently (see earlier review: Iggy's). 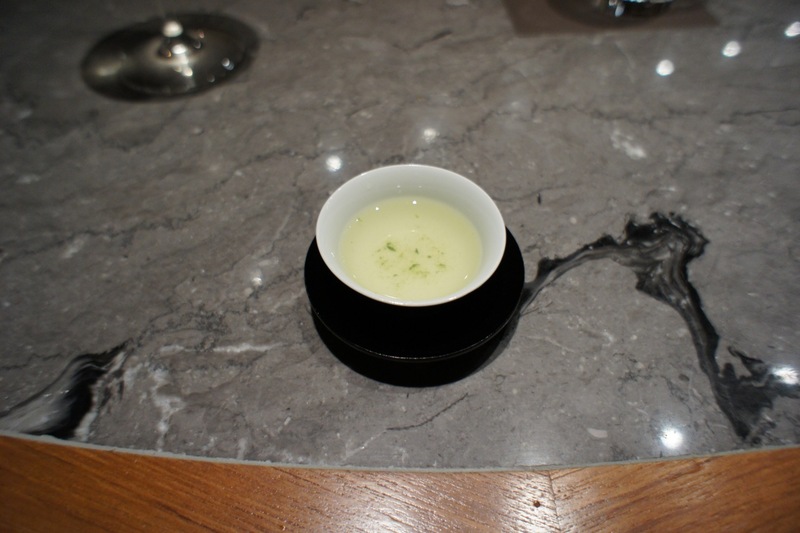 In the Japanese tradition, dinner (before we moved off for dessert) was ended with a cup of green tea called Gyokuro, which was very interesting as it was brewed at relatively low temperature (40 deg C) and tasted like a consommé. 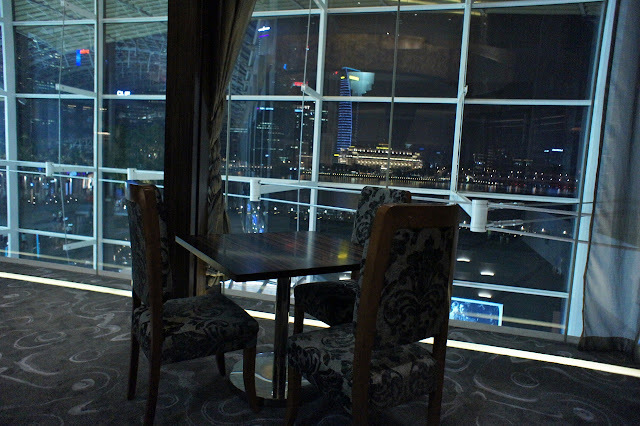 For dessert, we were ushered to another dining room, this one with views of the Singapore cityscape. There was a laser lights and fountain show going on outside at that time which we could watch also. One annoying thing the restaurant did, was to give us new glasses of sparkling water from a new bottle when we hardly touched our previous glasses of sparkling water at the teppanyaki counter. When queried later about 2 bottles of sparkling water on our bill (we could not have drunk more than half a bottle in total), they claimed that they typically charge one bottle per person, which we thought was strange. 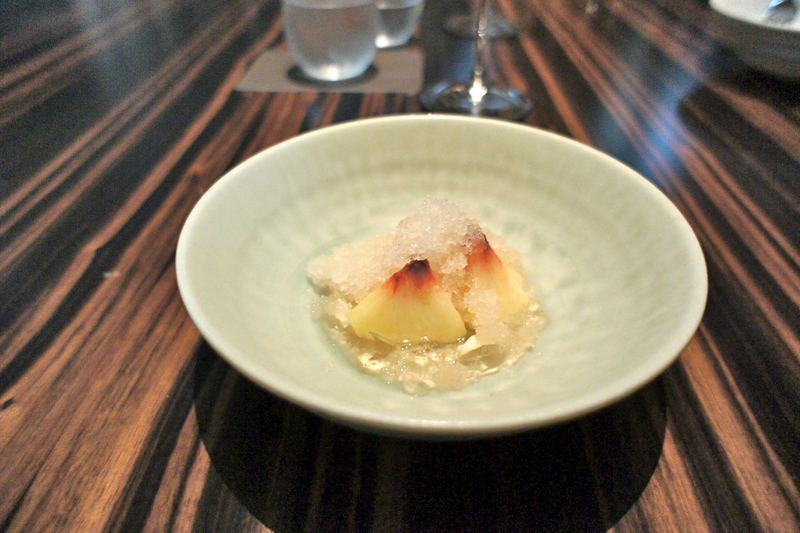 Japanese White Peach with Granita of Champagne: this was a interesting and refreshing dessert of crushed ice made from champagne, almond slices, jelly and peaches. The peaches were amazingly sweet (as all Japanese fruits tend to be). I couldn't escape the thought that this was a higher class version of the Singaporean hawker centre favourite, ice jelly. Salted Sable with Tasmanian Leatherwood Honey Cream: also another good dessert. It avoided being too sweet and was a good end to the meal. We were presented with a printed copy of our menu for the evening which was a nice touch (spared me trying to make our their accents when describing their food). Objectively, it was a very good meal. However, given its hype and Tetsuya's longstanding reputation in Australia, we expected more. 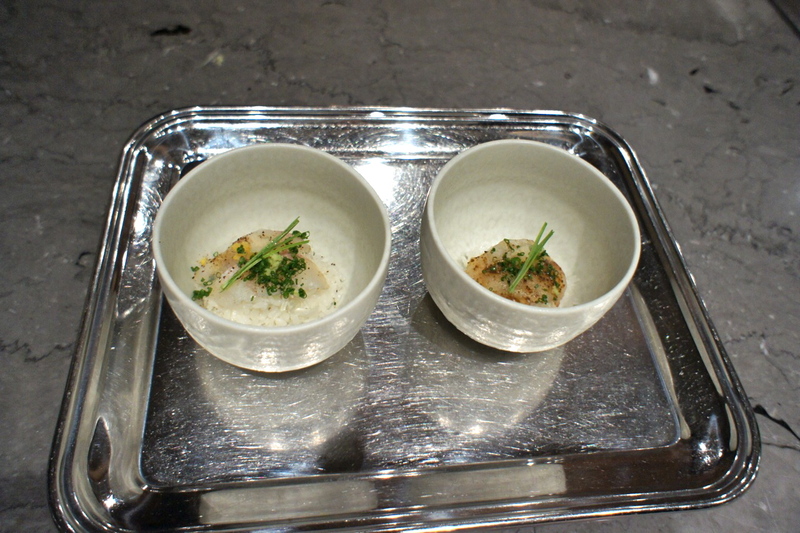 It was interesting that the concept of the meal and much of its preparation was Japanese, the ingredients were mostly Australian and there were hints of European techniques used. 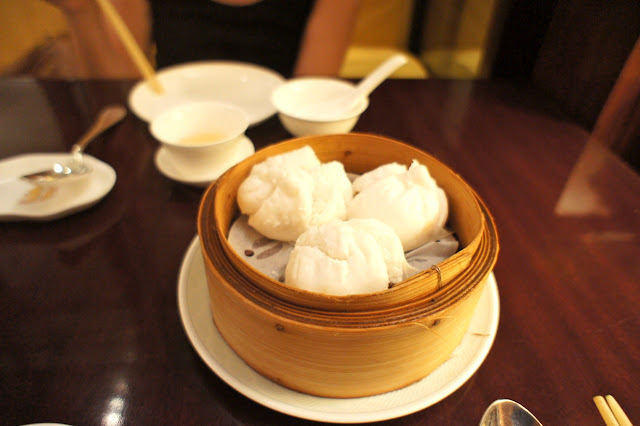 But it was all too predictable and we weren't surprised by any of the dishes. 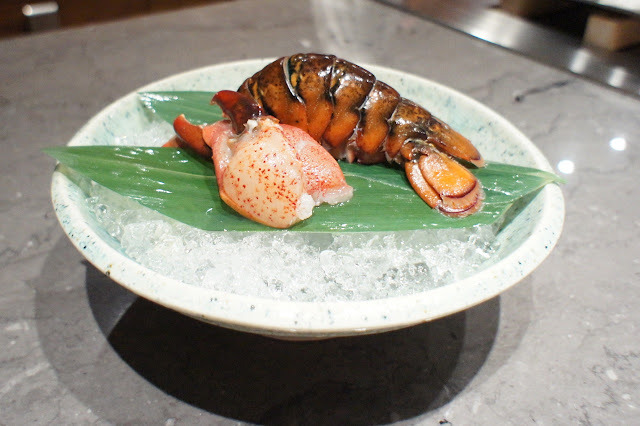 If one were to be preparing a S$400 per head meal, the safe and logical choice would be to include lobster, caviar, sea urchin, abalone and wagyu; that in itself made the meal quite boring. At this level of dining, we expected to be wowed by something different. This meal, the setting, the ambience and many of the dishes reminded us of our recent lunch at Ukai-Teh in Tokyo, except that the abalone was bigger there, the steak served was the fantastic Kobe beef and it was significantly cheaper (see earlier review: Ukai-Teh). Service was suspect. In addition to the 'sparkling water incident' described above, when we were getting the bill, we asked if we had finished our bottle of wine, and the waitress then informed us that there was about an equivalent of a glass left in the bottle. We were quite shocked that they didn't bother to top up our glasses and that we could have left the restaurant without knowing that we hadn't finished our wine. Final Thoughts: This was our third most expensive meal ever (taking into account all beverages as well), after L'Osier (see earlier review: L'Osier) and Guy Savoy (see earlier review: Guy Savoy). At this price we expected perfection but didn't get it. 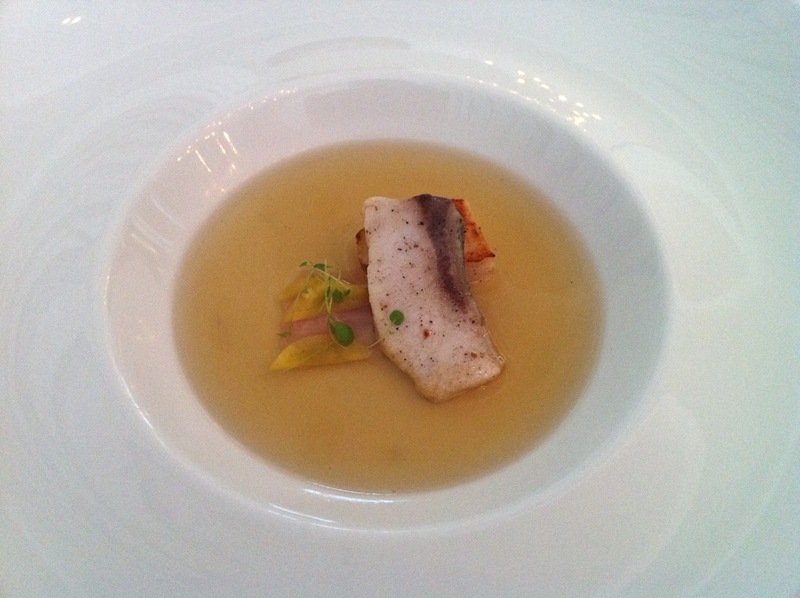 In a way, we left feeling like we did after we ate at Guy Savoy; that the reputation created expectations which failed to be fully met. 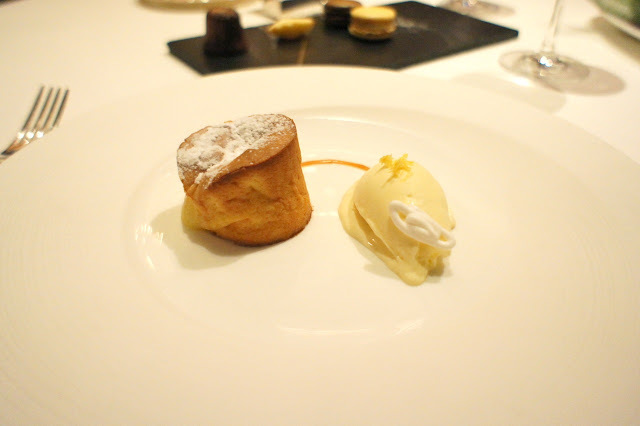 This would be my third review of Cepage, a 1-Michelin star French restaurant in Hong Kong (see earlier reviews: Cepage 1 and Cepage 2), and so this writeup will focus mainly on the dishes we had this time round. One observation of the dining room was that it was looking a bit tired. 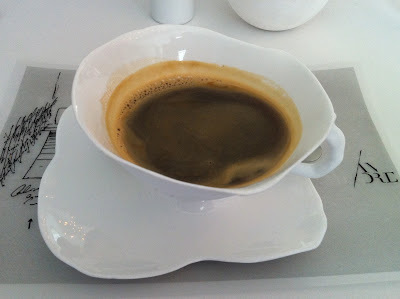 Perhaps our perception was affected by the quality of the diners present that night. There was more than one table where the guests were dressed casually; some in t-shirts and trainers. 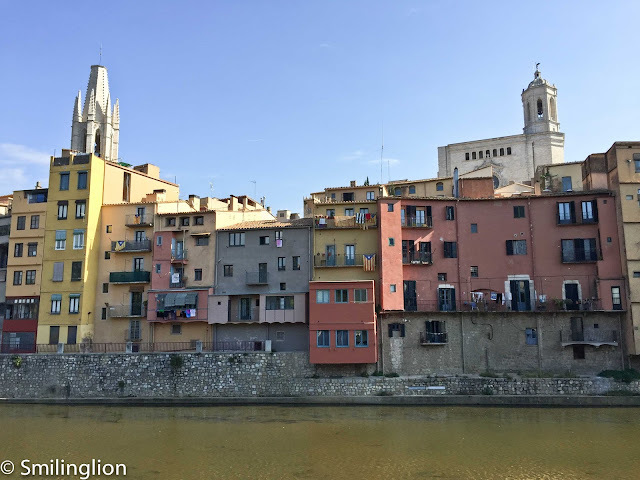 We naturally had very high expectations since our last few trips were very memorable, so it was not surprising when our initial impression this time round was less than stellar. The amuse bouche was a layered foie gras and jelly concoction with a spoonful of foie gras and red wine redux as the sauce. It was a good idea but taste-wise it didn't quite match up. To add to the disappointment, we were informed that the Limousin veal (which we had specially gone to this restaurant to eat) as well as the E'Paule (the lamb shoulder), were sold out. 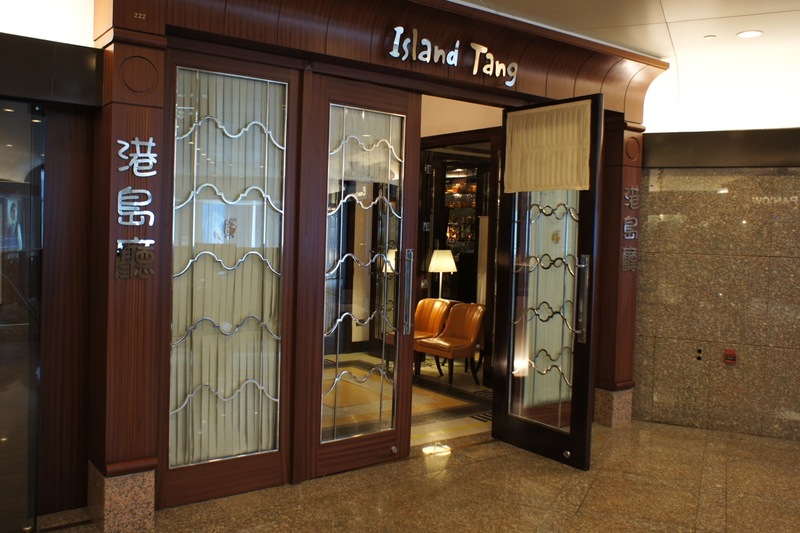 We were quite irked that 2 of its better known main courses were sold out already so early that night (Note to self: pre-book the Limousin veal next time we are in Hong Kong). 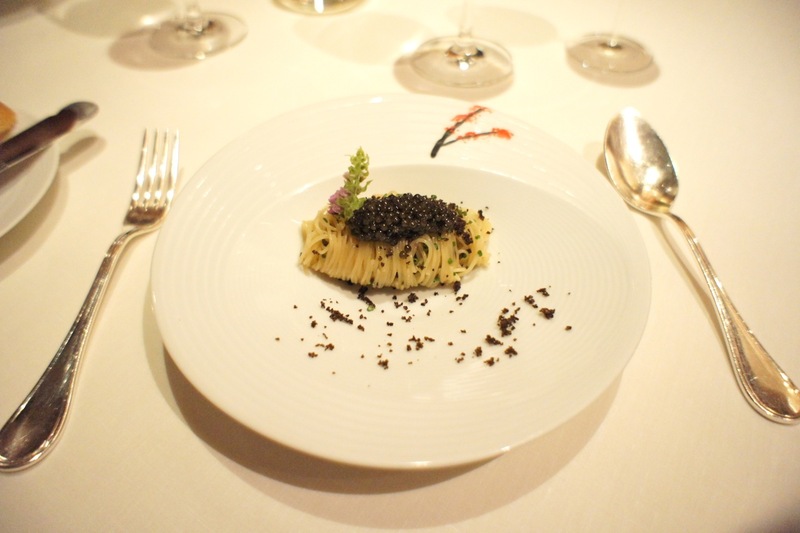 Angel-hair pasta with Oscietra caviar and black truffle - this was an off-the-menu special for the day. It was good but the version done by Gunther's in Singapore (see earlier review: Gunther's) with its use of kombu was better. 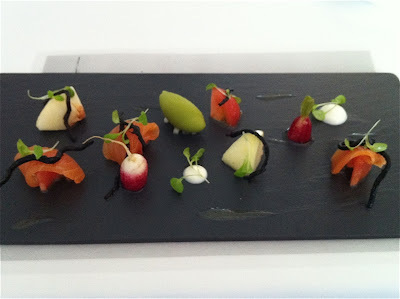 The portion of caviar was very generous though. 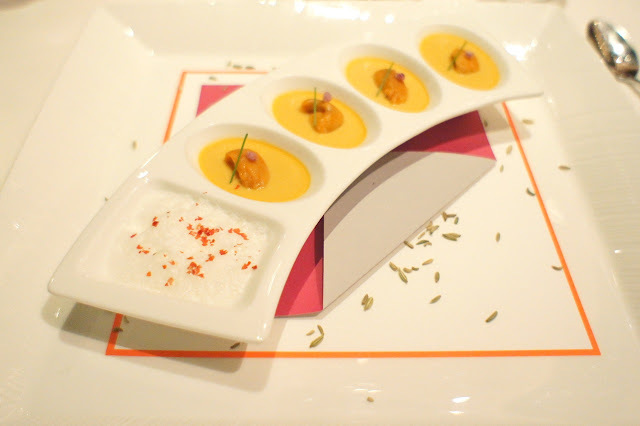 L'Oursin: Island of sea urchin on lobster custard and touch of aniseed - This was an excellent entree. The sea urchin was a perfect match for the lobster custard (which fortunately did not taste too eggy). 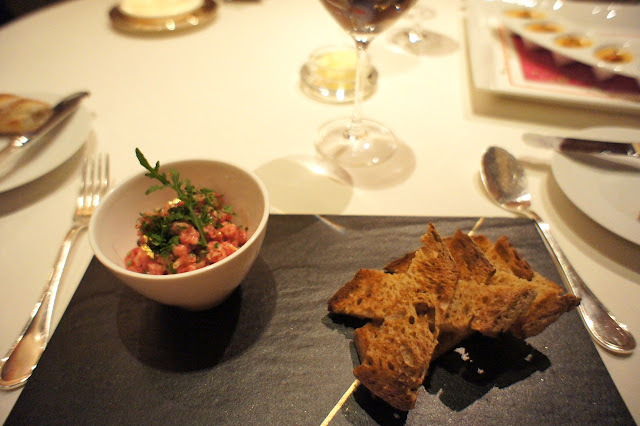 Steak tartare - This was another off-the-menu entree which was very well prepared. The beef was fresh and was well marinated with some mustard and pepper. The meal was looking up already at this point. Le Canard: Duo of steamed duck breast and foie gras - This was my main course. I typically shun duck breast because it is difficult to cook without making it too dry and chewy. But the combination of the duck breast and foie gras was interesting, and I decided to try it, without any regrets as it turned out. The duck was tender and maintained its juices well and the foie gras was a perfect counterpoint to it. 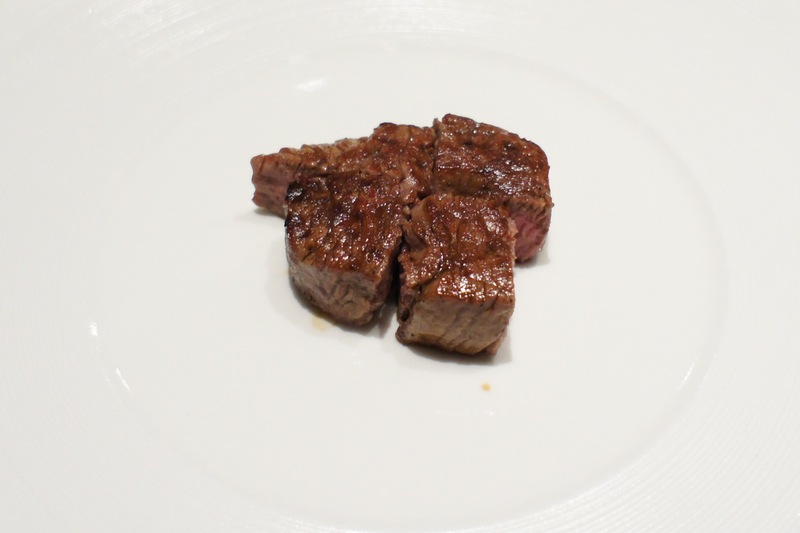 Both pieces of meat were arranged to form a circle, and reminded me of the yin-yang symbol representing perfect balance. 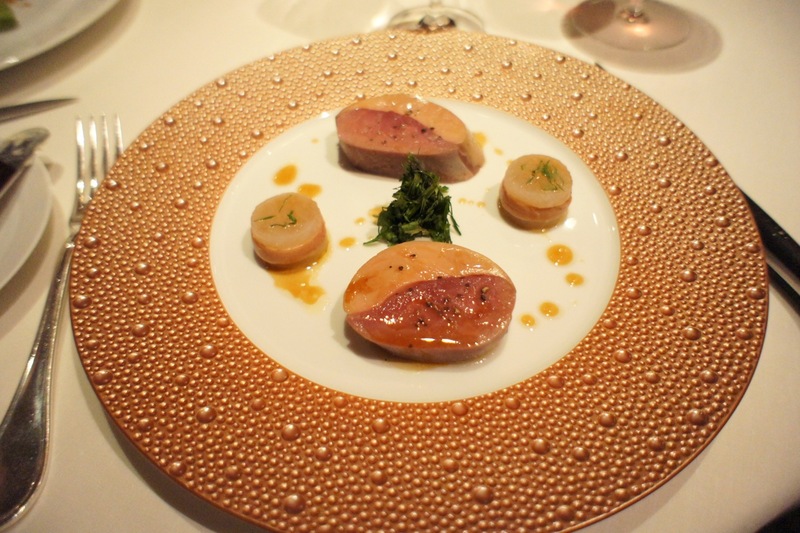 The soft melt-in-your-mouth foie gras would be the yin and the more substantial duck meat (which would require some chewing) would be the yang. A very good (yet relatively light) main course. 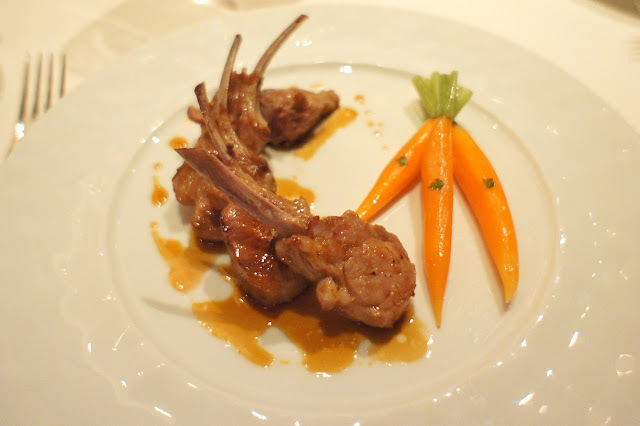 L'Agneau: Milk fed baby lamb cooked in a "plancha" style, glazed baby carrots, lamb jus - This was my wife's main course. She enjoyed it thoroughly as the sauce in particular, was excellent. 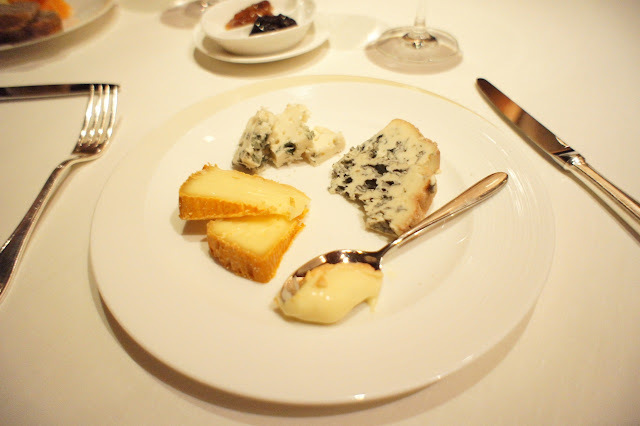 The usual french cheeses were served before dessert and they were quite unremarkable in this instance. 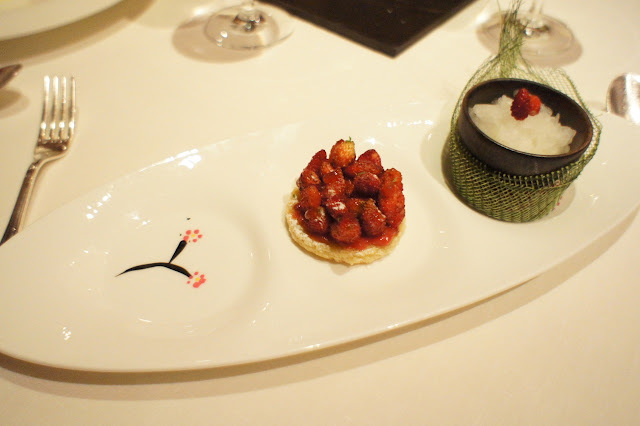 La Fraise Sauvage: Malaga wild strawberry tart, vanilla cream, lime granite - The signature dessert of the chef and it was a delightfully refreshing dessert. The strawberries, though sweet, retained some of its sourness and that coupled with the crushed ice with lime, made this the perfect palate cleanser. 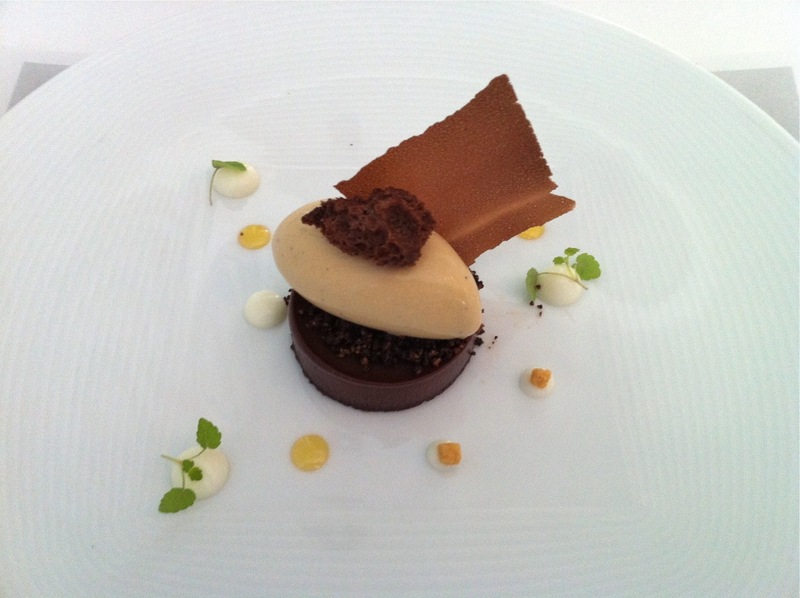 Some might feel that this dish would be insufficient to be the sole dessert of the meal. 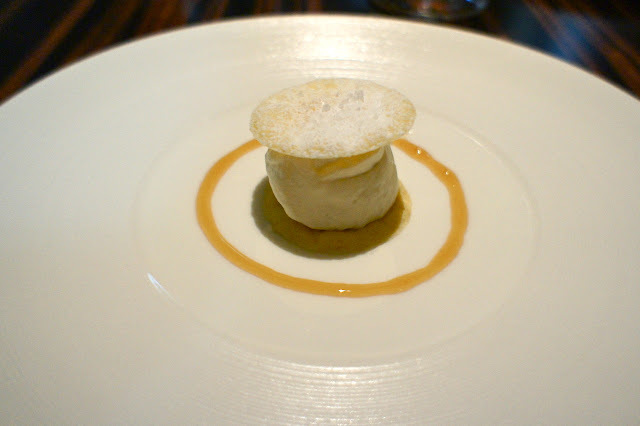 Le Citron: warm soft centered lemon cake, caramel sauce, lemon ice cream - Another very light yet very good dessert. Again probably insufficient as a standalone dessert (unless one was already very full) and could do with an additional dessert of chocolate (but then I may have been spoilt already by the mammoth dessert courses served in Paris). 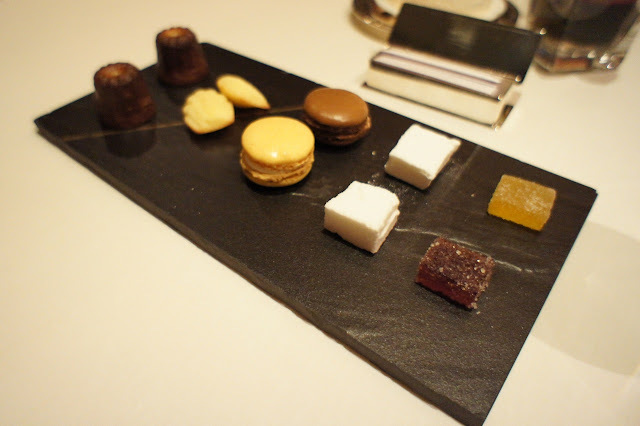 Some petit four to end off the meal. Final Thoughts: We still really enjoyed the food here, even though this restaurant just seems to feel more and more casual each time we come. Main courses in particular have always been top-notch. 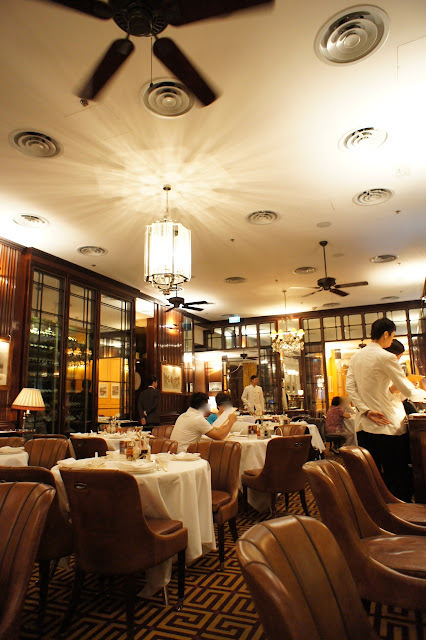 In addition, Cepage has one of the better wine lists in Hong Kong and even their wines by the glass at night were of a high quality.